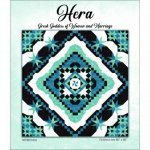 Hera a 6 month Block of the Month program. Kits are cut to order, so if you would like a different color set let us know! The original pattern calls for solid black, white on white and 2 shades of batik. We can kit this in any combination of color and or fabric you desire! This pays for the entire kit up front at a discount (compare to $ 65.00/month)! You can choose to have the program sent to you all at once or on a monthly schedule. Kits are cut entirely from the same bolts to avoid dye lot differences, so even if you choose to have your months delivered separately it is still cut from a single run of fabric. 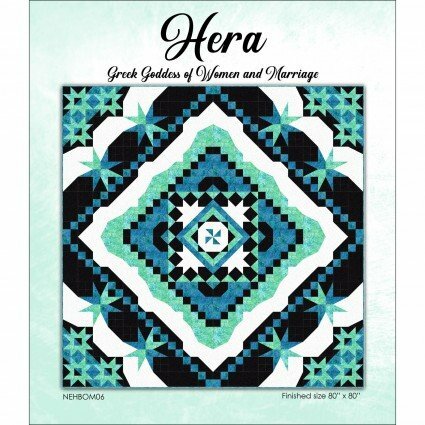 Month 1 includes the Goddess Tool along with your fabric and pattern. Your final month includes binding and backing material!